Contrary to what it may seem, yoga is not about bending your body in half and twisting into positions that would make a pretzel-maker swoon. Yoga is simply about opening the channels in the body to let energy flow freely. It’s about calming the mind through focus on the breath. And it’s about building strong and supple muscles and joints. Believe it or not, you can get all of these benefits with poses that don’t require you to turn into a contortionist or even be able to reach your fingertips to your toes. Here are five yoga poses for the not-so-bendy folks that don’t require flexibility, but will get you started down the road to yogi-dom. At first glance, the posture doesn’t look like it does much, but this pose is a way to calm the mind and body and slowly begin to open the back of the legs, the chest, and the neck. Sit sideways against the wall and slowly turn your body to lie back on the floor with your legs moving up the wall. You may need to adjust to get your body closer to the wall. You may also put a blanket or bolster under your hips for support. As you lay back, put your arms in goal post position to allow your chest to open. Just lie there and breathe deeply for a few minutes, reaching the soles of your feet up while allowing the tops of your thigh bones to melt down. To get out of this posture, roll onto your side before sitting up slowly. Lie on your stomach with your hands flat on the ground under your shoulders. If this is too much pressure on your shoulders, move your hands forward so your forearms are flat on the ground. With the tops of your feet flat on the ground, use your hands to press your upper body away from the ground. With your shoulders moving down your back, reach the top of your head up and move your chest forward through your arms. Cobra posture is a wonderful heart opener and will also help strengthen your back. 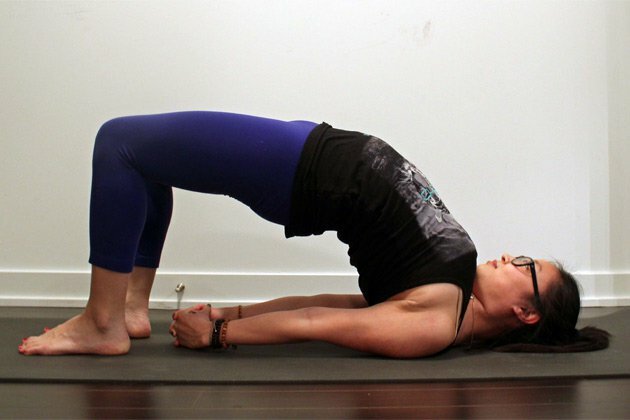 Bridge may sound slightly intimidating, but the more you practice it, the more flexible you’ll become. Lie on your back with your knees bent and feet flat. Slowly lift your hips toward the sky. You may not get very high, but that’s ok. Hold it for 10 to 15 seconds, breathing deeply. As you get more flexible, try clasping your hands together under your body, pressing down with your forearms. Bridge will work to open the front of the hips and the chest—and it’s a great way to relieve stress. Child’s Pose is often seen as an “easy” posture, but just because it can be considered a resting pose doesn’t mean it doesn’t have tremendous benefits for the body. Starting on your knees, lower your hips back toward your heels and reach your arms forward. Move your body in each direction as far as you can comfortably go. Breathe deeply in this posture and continue reaching your hips back and the crown of your head forward. Child’s Pose helps to open the back and hips to really get stuck energy moving again. 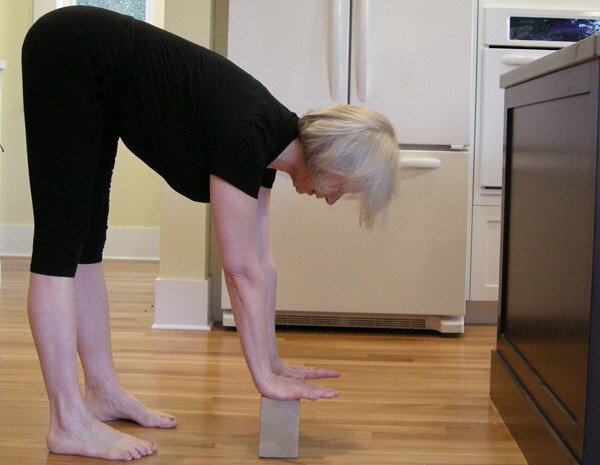 Even if you can’t reach the ground, you can still benefit from doing a Standing Forward Fold. Stand tall and bend at the hip. Place your hands on your thighs, your shins or your ankle. Anywhere you can reach is fine. Another option is to use blocks to bring the ground closer to you. Whichever modification works for you is perfect and will still allow you to reap the benefits of the pose. Breathe deeply as if you can feel the breath reaching into your lower back. Standing Forward Fold works to open the back of the legs and the lower back—two places where energy often gets stuck. So, to those of you who are using the excuse—or have friends who argue—that they can’t do yoga because they’re too stiff or they’re “just not bendy-twisty,” I’m here to tell you that you can do yoga and reap the amazing benefits of the practice. Most importantly, don’t force your body into postures you’re not ready for. Start with these poses and before you know it, you’ll be feeling better, and your body will open to the possibility of other poses too.